The Simpsons have never been strangers to video games, appearing on almost every console and handheld during their ongoing 25 year syndication. As the show has evolved the games have changed from Bart Simpson’s adventure games, to parodies of established formulas like Tony Hawk’s Pro Skater and Grand Theft Auto and onto the grand outing in The Simpsons Game. However in recent years the family have been pretty quiet on the video game front, TV and movie tie-ins aren’t so popular today as they once were; “serious” gaming has not been kind to The Simpsons. 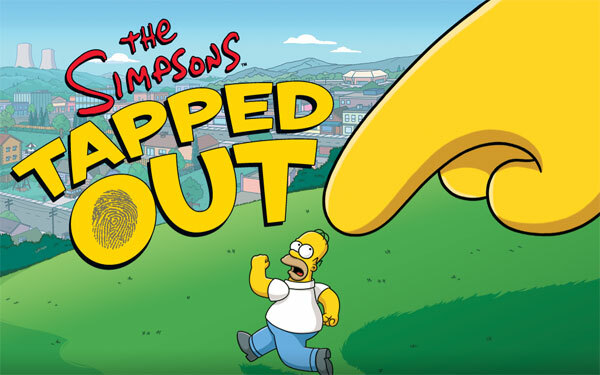 Then the app craze hit and The Simpsons Tapped Out arrived in 2012, allowing the family to grab our attention all over again. However like other recent TV series outings, could this be the shows definitive gaming experience? From the beginning of Tapped Out it’s clear that like its predecessors, The Simpsons are once again parodying an established formula. The happy little elves city building game Homer mocks in the opening cut scene makes this very clear. Unlike recent releases such as the Batman Arkham series and South Park: The Stick of Truth, the game doesn’t redefine the television show in video game format. The game is still fun to play but we don’t expect our characters to surprise us in this outing, with aspects like the episode promotions causing the game to at times appear as an elaborate advertisement to the show rather than a must-see experience for the fans. When we begin to play Tapped Out however, there is certainly excitement in the air, the promise of being immersed within Springfield hasn’t been so tantalising since Virtual Springfield back in 1997. This time though the city is yours to mould and develop the way you always envisioned. Furthermore with so many recognisable characters to unlock along the way it’s easy to be enthralled when reaching each new level. How can there be a Springfield without Lenny?! Must… reach… level… 27! All this combined with quests that revisit some of the most memorable moments and storylines of the series, fills the game with nostalgia from the show we’ve enjoyed for years. While the gameplay may not feel like watching an episode of The Simpsons, the growth of your town certainly evokes many fond memories of them. However all this fondness can only last so long, and sadly the best the game has to offer is over once the original 20 levels have been completed. The loose storyline of Homer reuniting with his family finishes at this point; the game continues without real purpose and reveals the most striking resemblance it has with the series. The only true objectives from here on out are to continue building and participate in the next seasonal event; things continue but the heart and soul of the project has ended. Like the show itself, plot lines become more zany and nonsensical (if not downright forgettable) and the family themselves spend less time together and more time with their secondary, tertiary and one-line gag cohorts to keep churning out more content (the Yes-Man comes to mind here…). Like Bart and Lisa’s heartfelt conversation in the treehouse in “Holidays of Future Past”, the family being together is something that we see so little of, that when it happens we realise how much we’ve longed for the heart-warming effect the family once had on us almost every episode. Even the seasonal events are starting to feel like cheap gimmicks to keep us interested; making us believe in a fresh coat of paint for what is really an evil random number generator that will only disappoint. While the recent Stonecutters event has reignited the excitement of the game for many by reintroducing the challenge of past events, will this kind of quality last? Furthermore by giving the fans exactly what they want here, are we heading towards the kind of debasement that the Family Guy crossover has caused for many? Why do we continue tapping through this yellow town? The answer to this may is yet another strong resemblance between video game and cartoon. We continue the game not necessarily because we’re enjoying ourselves, but because we enjoy reminiscing about what once was. The fresh and clever humour, the compelling family dynamic that is so destructive yet tugs at your heart strings. While we play or watch the newer episodes we think back to earlier days and hope that the next event/episode will be one of the old ones we’ve been enjoying for years. While Hibbert and Bernice argue through level 41 we hope maybe the Springfield Monorail or Homer jumping the gorge may be our next event to follow, or maybe Homer and Marge might do something between each other without the rest of their friends and neighbours; get back to the heart of the matter. Thus while this is no new ground between video game and TV like perhaps South Park and Batman have undertaken, The Simpsons Tapped Out is most certainly embracing the original material in ways we never expected. While we may largely enjoy the experience for what it once was, the fact that it is still in continuation is a comfort, because while the world around us is changing so rapidly, we still have The Simpsons chugging along with us. To have this game so readily available on our mobile devices now, allows us to become just a little closer to the town that has given us so much. Therefore while Tapped Out may not be as great as it used to be, it holds the crown for the most definitive Simpsons gaming experience because it embraces all the good and bad the series has given us, and uses it all unashamedly as a triumph to its longevity.